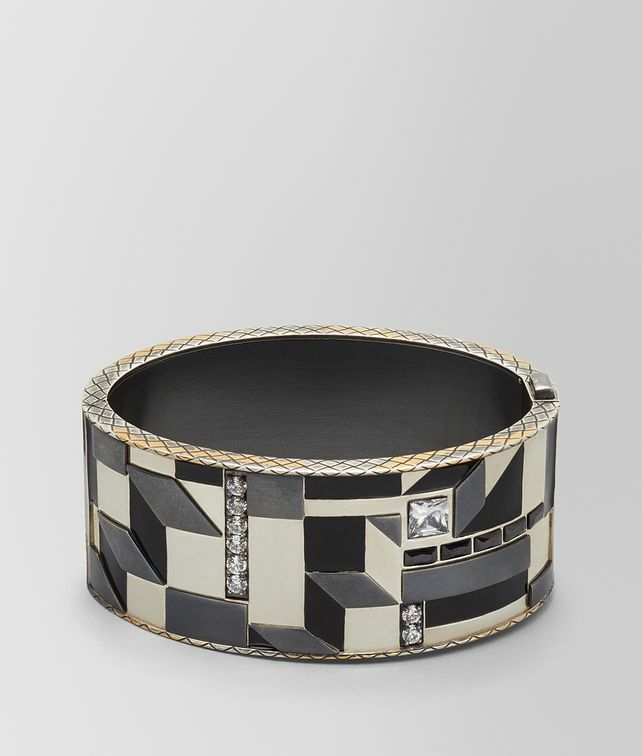 This cuff is part of the BV Inlay Deco collection, inspired by the iconic architecture of New York City and featured in the Fall/Winter 18 runway show. Reminiscent of Art Deco style, it is made with sterling silver and inlaid with cubic zirconia and enamel in varying depths, creating a three-dimensional effect. The edges are finely engraved with the intrecciato pattern and brushed with a 24-karat gold patina. Gently push the silver buttons to open and close. Dimensions: 6.2 cm x 4 cm x 8 cm | 2.4" x 1.5" x 3.1"